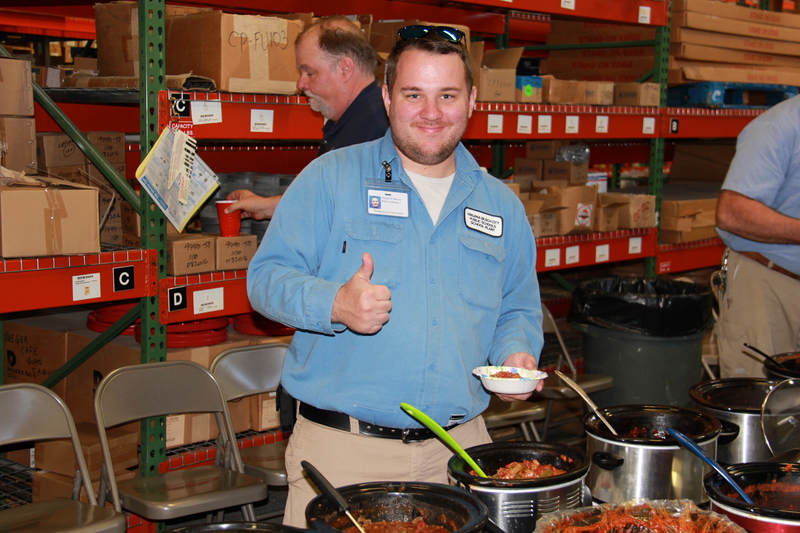 His pride in the hot sauce that makes grown men turn red, sweat and cry, is only one reason the Office of School Plant Services hosted a chili cook-off for the second year in a row – and this time in partnership with the Office of Facilities Services. Woodhouse, only one month on the job in school plant, couldn’t help but smile at the long line of men and women waiting for a hot bowl of homemade chili. “Actually, I’m shocked there are so many people. I didn’t expect it to be this big,” he remarked. Hosting similar all-staff events and involving retirees to participate and share lessons learned, is what Woodhouse plans to have happen moving forward. “We’re trying to build a team and build a family,” he said. 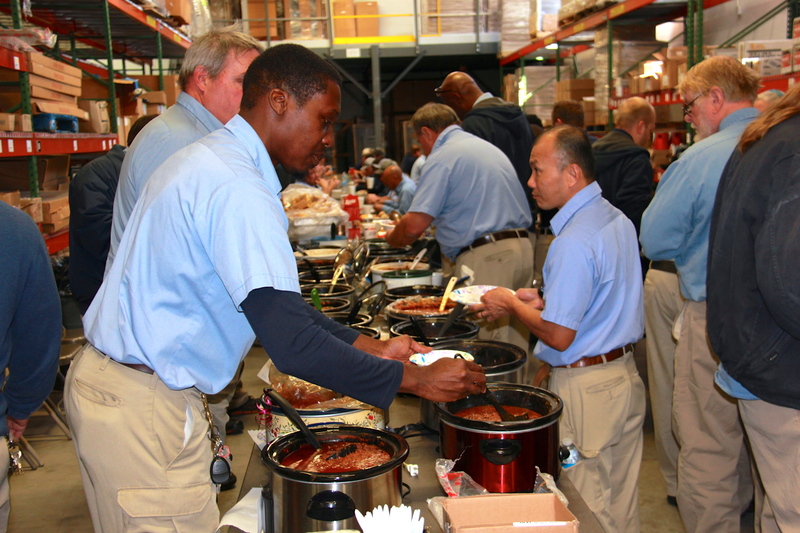 In the short term, the teams in the offices of school plant and facilities services are just trying to build a recipe for winning chili. 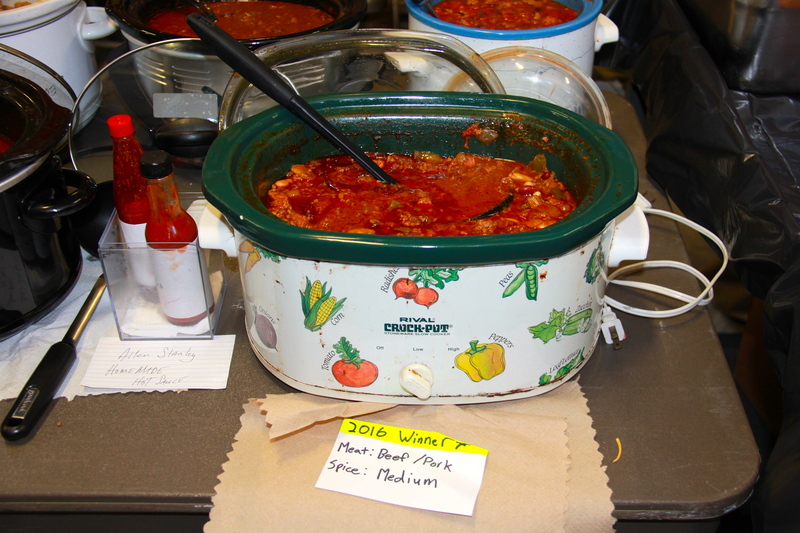 Only 12 entries were judged, even though each shop prepared multiple pots of chili and additional dishes like gumbo and meatballs. Kenny Evans, general maintenance supervisor who established the event last year after seeing each shop had separate winter holiday parties, explained the process. “What happens is every shop submits three to four pots of chili, and then within that shop they pick the one they want judged upstairs,” he said. Wendell Jenkins, general maintenance coordinator, noted one other consideration for the competition. We heard. Hot enough to kill you. The winning teams received gift cards as well as plaques made in one of the school plant shops. “There isn’t much we don’t make,” said Evans. Nice article; great to see everyone getting involved and having a good time.